New studies say Dark Chocolate really does help heart health. 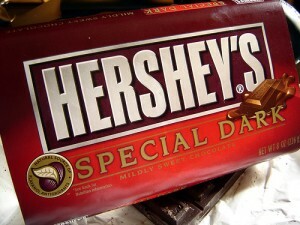 Perfect timing since it’s nearly Valentine’s Day and just the time to indulge in some sweet dark chocolate. I’m all over dark chocolate – honestly it’s my favorite and I’m very happy to hear the tidbits I sneak in daily my have positive health properties. Have a sweeter Valentine’s Day this year by incorporating moderate amounts cocoa and dark chocolate into your lifestyle. According to the Hershey Center for Health & Nutrition, recent studies show that natural cocoa and dark chocolate may have properties that contribute to heart health such as reducing blood pressure and cholesterol. Take a look at Hershey’s Perfect Portion Guide to help you visually determine how much of common foods to eat. Did you know that 1 oz. of dark chocolate is about the size of a matchbox? Enjoy chocolate as part of a balanced, homemade snack by adding bits of dark chocolate to yogurt, trail mix or low fat ice cream. Try incorporating a little cocoa into everyday meals, such as this recipe for Cocoa Spiced Beef Stir Fry. For more information about the health benefits of cocoa, please visit the Hershey Center for Health & Nutrition website.